Josie Rourke’s updated version of George Bernard Shaw’s acclaimed 1923 play, Saint Joan, features a powerful, charming performance in the title role by Gemma Arterton at the intimate Donmar Warehouse in London where a concentrated audience, only four rows deep, observes the action on three sides of the stage. The glamorous English actress, better known to South African audiences for her roles in films such as Quantum of Solace, Tamara Drewe and Song for Marion, shows bags of determination, as well as spiritual purity, in her role as the Maid of Orleans whose heroic military exploits eventually ended in her tragic death at the stake in Rouen on May 30, 1431. 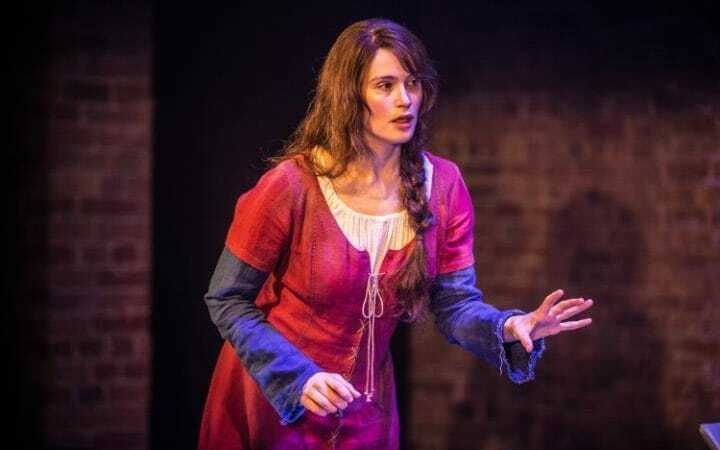 Rourke conceives the play as a clash between the medieval Joan – dressed in period outfits – and duplicitous, self-serving boardroom executives that you would find in London today. The military and financial events that punctuate Joan’s familiar story are announced by a newsreader on a large screen. The intention is clearly to isolate Joan and show that her spiritual purity is threatened at every turn by various kinds of functionaries of the economic, religious, class and political status quos. All this is very clever and helps us to view the play’s themes in a modern light. At the same time, however, Shaw, at his best, is the kind of playwright who gives equal weight to both sides of the argument and Rourke’s conception risks making the divide between Joan and her detractors too simplistic. The play has been described as “a tragedy without villains” because all the players believe they are acting for what they conceive of as the good. Joan, taking note of her spiritual voices, is the classic outsider who threatens men who belong to powerful institutions. It is this that is Shaw’s great theme, namely the conflict between the inspired individual and the established order, and Rourke’s conception arguably disguises rather than illuminates this. But the play is certainly not sunk by this mini-iceberg, if such it be. Shaw’s sparkling dialogue is entertaining, informative and thought-provoking. The men in the boardroom – both English and French – are all, in their different ways, threatened by Joan. The smooth Warwick represents the English aristocracy which fears Joan’s French nationalism while the churchmen are terrified that Joan’s personal relationship with God bypasses (and therefore sidelines) the church, the Pope and religious authority in general. The camp Dauphin, later to be crowned king by Joan herself, simply wants her to “chill”, allowing the war to end and his easy life to continue. It is, ultimately, in all their interests that Joan be condemned to death. And while it is easy to sympathise with the passionate Joan, particularly after she inspires the French army to lift the siege of Orleans, it’s easy enough to see her religious fanaticism also carries with it dangers to established secular society, a fact most obviously borne out in modern times in the guise of Muslim militancy. Whatever the intellectual attractions of the play, it is Arterton who shines brightest. Her stellar performance combines charm – she is tactile at times, innocently caressing her antagonists – and humour as well as a fiercely held belief in her “voices”, her personal relationship with God and her desire to drive the English out of France. The force of her individual vision, it is plain to see, sits awkwardly with the world in which she lives. From this follows one of the play’s biggest after-shocks. Towards the end one of the characters cries: “Must then a Christ perish in torment in every age to save those who have no imagination?” It is this notion of Joan-as-Christ, and the sinister prediction that great spiritual people will always fall foul of humdrum, destructive humanity, that is perhaps the most disturbing implication of this brilliant play.